25 Years ago Val Sabin was the originator of teaching manuals for physical education. We are still the only publisher to produce specialist comprehensive and user-friendly PE manuals rich with subject knowledge. Each manual has been produced to answer a specific need, and all the material exceeds National Curriculum requirements, is thoroughly tested, and proven and is fully inclusive. The manuals are now used in schools all over the world. 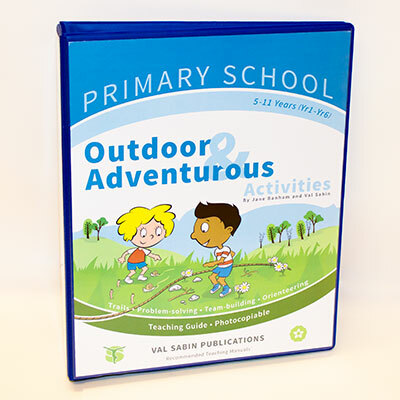 We are still the only company to produce complete, whole-school schemes of work for Gymnastics, Dance, Games, Athletics and Outdoor and Adventurous Activities for Primary Schools and have the largest range of Physical Development publications and activities for the early years. We can provide a totally unique and bespoke inset and regional training for any subject areas covered by our manuals, including administration, planning and assessment. Our delivery team are all highly trained advisors and are all QTS. Our manuals are progressive and developmental throughout and are the most comprehensive and user-friendly. The whole school “master manuals” are printed on card in ring-bound folders and come with a copyright waiver for the purchasing school which means that teachers can photocopy and personalise their lessons. A teaching guide (including a simple assessment system and planning grid to help the PE co-ordinator). Lesson plans divided into units of work. A section at the back on breaking down and teaching the specific skills of the subject, or providing any essential resources. To complete the package there are accompanying CDs where appropriate (e.g. 9 CDs for Reception KS1 and KS2 Dance). This makes each manual a unique and invaluable single source reference. Using them has been described as “training on the job”. 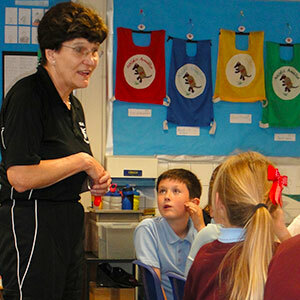 Val Sabin initially trained as a Physical Education Specialist at Bedford College and has worked with children of all ages, students and teachers for over 35 years on all aspects of Physical Education. Val is internationally known for the quality of her teaching and her ability to enthuse. Many children taught by Val have succeeded in team and individual competition at local, regional and national levels. Val Sabin was a teacher, a Head of Department, and Advisory Teacher and consultant in Northamptonshire, a Senior Lecturer in Physical Education at De Montfort University in Bedford, is the author of over 40 teaching manuals and has been an OFSTED Inspector for both Secondary and Primary phases. Currently her main work is as Consultant, Advisor and Trainer delivering Gymnastics, Games, Dance, Athletics, Positive Play, PE Administration, Activate and Action Kids Foundation Stage physical development with fun courses for teachers and teacher trainers throughout the UK. Edina creates all of the amazing illustrations that are used throughout the manuals and for Action Kids and Sporty and Friends publications. Anne-ki prints and compiles all of the manuals, CDs and DVDs. Dan looks after the website and creates the desk top publishing for the manuals and publications. Karen is the qualifications and training manager. Anne, Karen, Lucy, Carole and Neil are all National Val Sabin trainers.